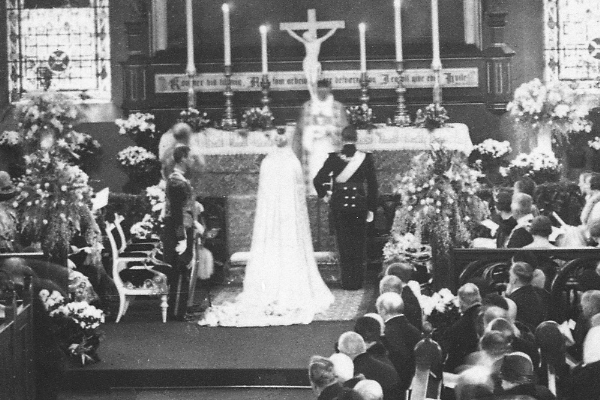 89 years ago today, Norway celebrated the wedding of its future king, Crown Prince Olav. The bride was a Swedish princess, Martha, bringing together the new Norwegian royal family with its former royal dynasty. Today, we've got a look at the wedding in still photographs, plus moving images to help it come to life! The wedding celebrations included multiple events, and newsreel footage from the festivities show the couple in various outfits and locations. Here, they wave to the crowd during a procession in daytime attire, part of Martha's official arrival to Oslo. Martha and Olav's relationship was a love match, but it also had the added benefit of linking together two important strands of Norwegian royal history. Crown Prince Olav was the second generation of a new dynasty, which had been elected to reign over an independent Norway in 1905. Martha was a Bernadotte princess from Sweden; until the union between Norway and Sweden was dissolved in 1905, the Bernadottes had ruled over Norway, too. The couple were also first cousins. Olav's father, Haakon, was an elder brother of Martha's mother, Princess Ingeborg; Haakon and Ingeborg's parents were King Frederik VIII and Queen Lovisa of Denmark. Olav and Martha's marriage, therefore, was a true union of the Scandinavian monarchies. 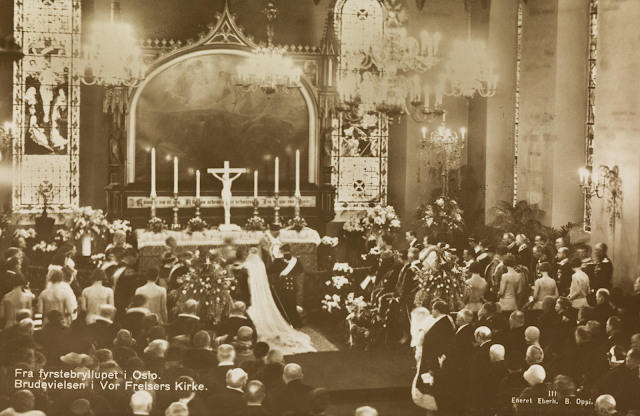 Olav and Martha's religious wedding ceremony at Oslo Cathedral went a bit more smoothly than James and Anne's hurried wedding three centuries earlier. Footage from the wedding ceremony itself is a bit limited, but here's a glimpse inside. Afterward, the bride and groom hopped in a carriage for yet another royal procession. Oslo had plenty of royal wedding time to make up for, after all. Here's a look at what the couple wore on their wedding day. 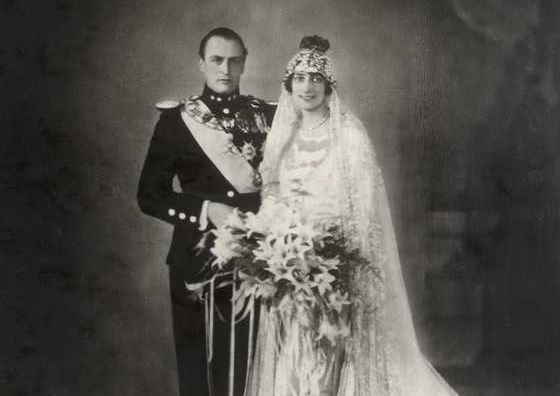 Note that Martha chose not to wear a tiara with her bridal veil. Instead, she's wearing a wreath of orange blossoms and a traditional Swedish bridal crown made of myrtle. Martha did receive several pieces of jewelry as wedding presents, including the lovely Vasa Tiara. Here's a bit of fun: a very hi-res version of a photograph from inside the royal wedding. Clicking here should bring up a much larger version, where you'll be able to pick out a few interesting details, including Crown Princess Louise of Sweden wearing Queen Sofia's Tiara and Queen Maud of Norway wearing the Maltese Circlet.